When my kindergarten class has inside recess (which due to the ice storm and major snow this year we have had plenty) we take a vote on weather we would like some inside play time or watch an educational DVD. Most of the time they would rather play. Since I have introduced LeapFrog Videos to the kids, they have changed their tune. LeapFrog creates wonderful educational DVDs that satisfy both the kids love of cartoons and adventure and my need for them to learn essential skills to become better readers and mathematicians. 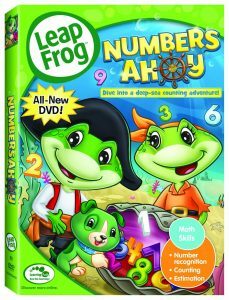 Recently we were sent the latest DVDs from LeapFrogs cataloge of educational videos, The Amazing Alphabet Amusement Park and Numbers Ahoy. 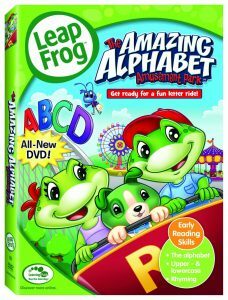 The Amazing Alphabet Amusement Park (Ages 3-6): When their firefly friend, Edison, takes Tad, Lily and Scout to the place of his childhood dreams, the gang is shocked to discover that Alistair Alphabelly’s Amazing Amusement Park is… closed! To make matters worse, Edison has gotten himself stuck atop the Fantastical Ferris Wheel. The only way to save him is to turn on the rides in the park with the magic of the alphabet. Now the children must learn all of the letters, big and small, to save their friend, save the day and perhaps even meet the rhyme master himself, Alistair Alphabelly! Numbers Ahoy (Ages 3-6): Tad and Lily need a little number sense to help them get through a complicated game. So their magical firefly friend, Edison, takes them on a fantastical journey under the sea! When a pirate mistakenly captures their cute puppy pal Scout, they must use their new understanding of counting, grouping and estimating to rescue him. Join them as they navigate the deep and face foes such as sharks, crab henchmen—even Pirate Pythagoras himself—and begin to see numbers in a whole new way! Both of these DVDs are wonderful! Both the kids and I enjoyed the sing-along songs. I love that the kids got up and danced (after all, this is indoor recess and they still need to exert energy) to the songs and reading and math skills were being reinforced from what we are learning in school. My son, TJ, loved watching The Amazing Alphabet. We got him “Scout” the dog for his first birthday and he loved that his friend was on the screen going on an adventure through the amusement park. The alphabet was introduced several times throughout the movie and I loved that they didn’t forget to show what the lowercase letters look like (that is one of my pet-peeves as an early childhood educator). TJ is also a huge fan of music and especially enjoyed the “Big A, Little A” song they sing at the end of the movie. As a working mom, I struggle with TJ watching TV or movies when we are together because we don’t have a lot of time just the two of us. With that being said, he loves watching cartoons and I feel a bit better when he is watching something that is educational and that I think is a high quality teaching tool. 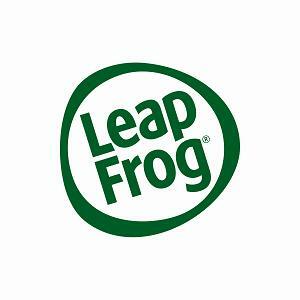 The products from LeapFrog help bridge that gap between what we both want for our free time together. Thank you LeapFrog! 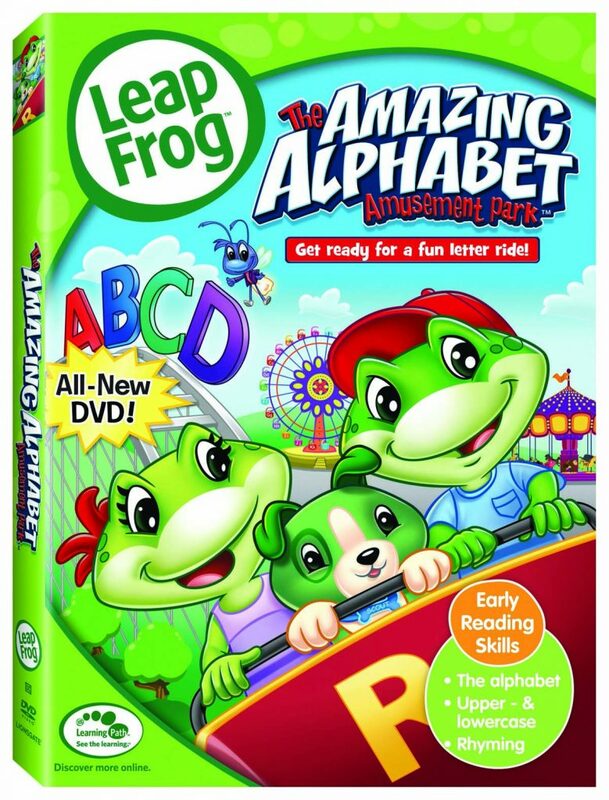 Be sure to check out the new DVD’s on LeapFrog’s website. They both retail for $14.98. This product review was made possible by LeapFrog. I was not compensated for this review other than a product sample. All opinions are 100% mine.